“Plastics Additives and Testing” is a practical book for engineers and operators and discusses both inorganic and organic chemicals that are widely used as additives in plastics processing operations. It is common practice today to use analytical techniques to improve plastics processing. Because it is critically important to manufacture quality products, a reasonable balance must be drawn between control requirements and parameters for improved processing method with respect to plastics additives. This book serves to implement this balance in the manufacturing line. Written by a successful, international consultant with an excellent publishing track record, it combines plastics additives, testing and quality control and is a valuable and critical book for engineers and operators to have when performing their tasks. 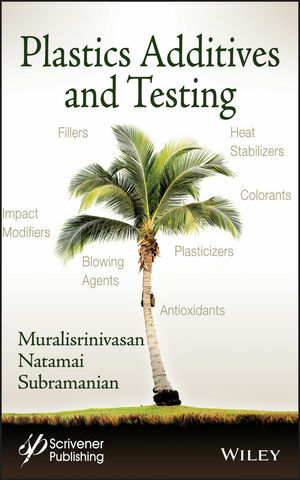 Muralisrinivasan Subramanian is a plastics technology consultant specializing in materials, additives, and processing equipment, including troubleshooting. He obtained his BSc in chemistry from the Madurai Kamaraj University and his MSc in polymer technology from Bharathiar University. He received his postgraduate diploma in plastics processing technology from CIPET, Chennai. He has also completed his PhD in polymer science from Madurai Kamaraj University. Dr. Subramanian worked in the plastic process industry, mainly in R & D, for thirteen years before turning to consultancy and building up an international client base. He teaches plastics processing seminars as well as being a Board of Studies expert member of colleges in India, advising on curriculum issues with regard to technology subjects.